As you’re scheduling appointments for your hair, makeup and gown alternations, you may be considering whitening your teeth before the big day as well. There are a few options if you want to try teeth whitening. Keep in mind that different shades of teeth whiten differently, so it’s a good idea to ask your dentist before you start. Bleaching strips on the market, such as Crest Whitestrips, often have good results with many patients and are a good, inexpensive way to try bleaching. You can find them in grocery and drug stores. 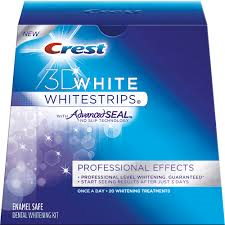 There are many versions of Crest Whitestrips available, from Crest 3D White Whitestrips Professional Effects to the Crest 3D White Whitestrips 1 Hour Express. Check out their coupon page for current discounts and promotions: http://www.3dwhite.com/crest-coupons/. If the results are not what you expect, you may want to try an in-office bleaching system. Systems can vary from office to office, but you can typically expect a combination of at-home and in-office bleaching. The first step is to have impressions made of your upper and lower teeth and customized bleaching trays are made for you to wear. These trays will hold the beaching gel against your teeth. You will be instructed to wear these trays for approximately two weeks before your in-office bleaching appointment, where a higher concentration of bleach is applied under a special bleaching light. The second step is to come into the office for an hour, where your gums will be protected by a shield and a bleaching agent is applied to your teeth. For the next hour, your teeth are bleached using a special light. After this visit, you are instructed to continue using the custom trays at home for another two weeks. The final step is to reevaluate the results. Make sure to talk to your dentist if the results aren’t what you expected; you may need to try the bleaching light a second time. – Minimize coffee, tea and red wine before your wedding, as these items are prone to staining. – Drink dark sodas or iced teas with a straw. – In combination with a whitening system, use a whitening toothpaste to help with surface stains. – If your teeth feel sensitive while using whitening products, you can try sensitivity toothpaste. If that doesn’t help, discontinue their use and talk to your dentist. Often the chairs at the wedding are an afterthought, especially if you’re trying to stick to a budget. However, there are all types of chair decorations for all types of budgets and styles. Keep in the mind the length of your ceremony when you pick ceremony seating. Cute wicker ottomans may look great in pictures, but if you have a long ceremony, your guests may appreciate a more comfortable seating choice. If you’re planning an outdoor wedding, keep in mind that dew or moisture may make cushions or pillows feel damp and a plain chair or bench might be a better choice. We love the idea of having unusual seating, but make sure you have a plan for who is delivering, setting up and taking down the chairs. If you’re renting from a company, find out the specifics on what is included and if you need to have additional help for set up. If you’re borrowing or gathering the seating from family and friends, make sure you have a plan for all aspects of the set up. For any decorations for the chairs, make as much as you can ahead of time. If you’re tying sashes on each chair, ask the venue if this is something you can do the day before. Otherwise, you’ll need to designate someone (or a few people) to help with this the day of. While you have a lot of aspects to design for your ceremony and reception, chair decoration isn’t necessary, but can be a really pretty addition to your special day. Need help with your wedding chairs? This is just one of the MANY things the Hello Productions’ Coordinators can help with on your wedding day! Be sure to check out the Hello Pinterest page for some of our favorite ideas!